What’s that? You haven’t heard of Data Privacy Day? You’re not alone. It’s not something everyone celebrates, and it doesn’t quite roll off the tongue, but it commemorates a very important milestone in the history of digital safety and security. The story goes all the way back to the early eighties, a decade before the “World Wide Web” went live to the world. In Jan. 1981, the Council of Europe ratified Convention 108, the first legally binding international treaty to ever enshrine protections for data privacy. Technology had advanced to the point where communication and data sharing had become more and more streamlined and automatic. Though it’s unlikely the architects of the treaty imagined a future involving a public internet, the legal language created a precedent for navigating fairness and justice in what would become a world dominated by digital interconnectedness. Initially, that language revolved around the “automatic processing of personal data,” setting up an international legal guideline to prevent abuses including discrimination or targeting based on things like race, health, religion, sexual life, and criminal records. In addition, the treaty enshrined certain freedom of speech elements by banning “transfrontier flow of personal data” and the right to prevent the storing of personal data against one’s will. Twenty-seven years later, the United States and Canada adopted the European tradition of recognizing January 28th as Data Privacy Day in 2008. Today, the National Cyber Security Alliance (NCSA) oversees the Data Privacy Day campaign, with the stated agenda to “inspire dialogue and empower individuals and take action” toward informing people about how their personal information is being used, collected, and shared within the digital landscape. The organization provides free privacy education and awareness resources and encourages individuals to engage in their workplaces, with their families, and among social circles to promote the cause. This year, the organization is hosting a series of TED-style informational talks and interviews on Data Privacy Day. Topics will focus on the latest privacy issues facing consumers and businesses. And the best part? Anyone can virtually attend. The event will be streamed live from Linkedin in San Francisco on January 28th. Learn more about how to get involved with Data Privacy Day on the StaySafeOnline website. 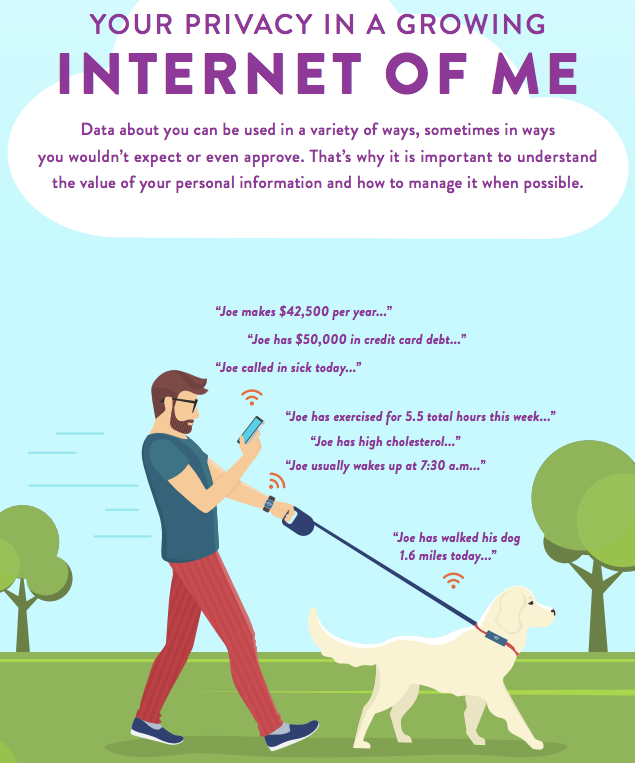 Ever wonder just how much the internet knows about you? Click the image below to see a full infographic that shows just how much information you’ve probably already shared with your devices.